Today’s post is sort of a mixed bag but the catalyst is on a book that I read recently. 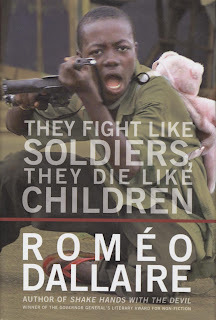 They Fight Like Soldiers, They Die Like Children is a non-fictional book written by former Canadian general, Romeo Dallaire (author of the much acclaimed Shake Hands With the Devil). 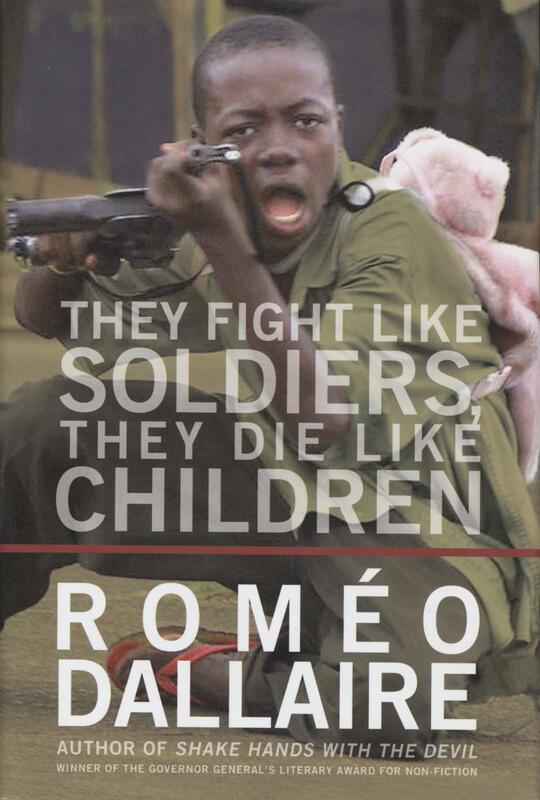 As the title would suggest, the book details the controversial subject of child soldiers. Although it is a problem that is seen in nations worldwide, much of the book is focused on the issue as it is in Africa. Dallaire paints a vivid and horrifying picture of this atrocity. Some of it is told by things he has seen himself while others are accounts from former child soldiers (or those affected). Dallaire walks the reader through why child soldiers are used and how they’re efficient, how they are trained, and the affect on the child and the community. The book is both effective and evocative because Dallaire is able to transfer us into the scenario. Aside from describing the actual conflict, he goes into some detail about why so little has been done, and what needs to be changed. Much of what he recommends as a solution reminded me a lot of the things I learned during my undergraduate career in engineering. In engineering, we learned about the difficulties of “end of pipe solutions” – that is, cleaning up a mess after it’s been spilt. It’s always difficult because there are many unknown parameters. It’s easier to plan and develop methods of preventing the spill from happening in the first place, and it is this approach that Dallaire recommends be adopted in fighting the war against child soldiers. There should not be the need to draw from the well of child soldiers. But the scope is huge. Last Sunday, we had a guest speaker (David Shulman, an awesome man by the way) at our church deliver a message on the “empires” and the evils that plague our society and distract us from real world issues. He spoke of how the empires don’t want you to care or to think about those things. We are overwhelmed by nonsensical media to keep our minds off of those subjects. During his sermon, I thought of KONY 2012. Remember KONY 2012? It was only a few short months ago (yet somehow, it feels like ages?) that Invisible Children put out a video detailing the horrors that the tyrant, Joseph Kony, was committing in Africa with child soldiers. It sparked all this conversation and created forums and threads of discussion. Everyone was talking about it – the light was shed. Yet, what happened a week or two after?... Invisible Children was lambasted for suspicious practices. Umm… What??! Effectively, the media shot down the messenger! Almost immediately, the attention was turned towards Invisible Children and away from Kony. The real matter. But the empire doesn’t want you to care about that. They’d rather you be distracted by more petty things. It is frightening how the truth can be sometimes; not only in Joseph Kony, but with ourselves, with our reaction and how we proceeded with our attention. The final segment of They Fight Like Soldiers, They Die Like Children is sort of a call to arms, where Dallaire encourages young folks to take action. The cause may seem gigantic compared to a single individual, but he notes that you can help by doing something as simple as voting for politicians who can make a difference. Life and issues like this can be more than just a glorified internet meme. We’re not limited by 140 characters. You have a voice, and Dallaire reminds us that we can use it.